In response to “LPG Injector Search” at Response... I recently came across this page for LPG injection: www.gas-injection.com The company is based in NSW and have successful working systems on Corolla 4AGE 20-valves and LS1 Clubsports. Hope this helps my fellow AutoSpeed reader. I really enjoy your range of articles - from outboard marine motors to some fascinating research on water spray kits for turbos, etc. I've been driving modified cars for over forty years but am unaccustomed to the units you use in reporting power and torque. This note does not intend to change the units you use, but suggests adding the equivalent in horsepower and foot-pounds. Of course, the conversion could be placed in brackets and I would guess that a fast-growing readership in North America and England would appreciate the translation. I have a degree in geophysics and could look up the conversions but that would take time otherwise spent reading your pages. Thanks for the praise. There are many different units that can be used for power, torque, pressure, temperature and more. We suggest adding Automotive Conversion Tables to your Favourites list or printing out a copy so you can convert to whatever unit you’re most comfortable with. Why don’t you do a test on a Toyota JZX100 series Chaser 2.5-litre turbo? They are available for importing under the new SEVS laws. An interesting vehicle - we’ll see what we can arrange. 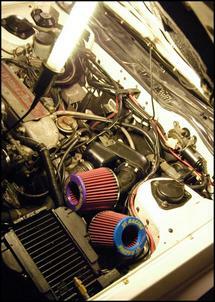 Any thoughts whether this product is of any real benefit in directing more cooling air across a top-mount intercooler? See http://www.dhcars.co.uk/ZeroSports_Forester.htm - a product called “Cool Action” halfway down the page. If so, what improvements might be expected? Looking at the intercooler on my Subaru Forester 2.5XT, I can clearly see a line of dirt where the majority of intake air is being directed. The Cool Action part seems like a reasonably logical bit of kit, but I’m not sure why Subaru wouldn't have incorporated something similar in their design? Any advice much appreciated. Thanks for the link. The graph showing the intake air temp with and without the product is interesting – we’ve never seen any figures associated with these so-called intercooler splitters. But why wouldn’t Subaru fit one as standard? That’s a very good question... We suggest that you ask the retailer for a money-back guarantee before handing over any cash. Alternatively, you can whip up a similar device at home using scrap aluminium. I just read your article on how to bypass an airflow meter (Airflow Meter Bypass, Part 1). I need to do it for a vane airflow meter but I'm worried that the vane will not rotate if a large bypass is installed (we are going to install a second throttle body to a BMW 535 manifold). Also, how difficult is it to build the digital fuel adjuster and the hand controller? We are used to doing ECU chip soldering (we are, among other things, the Superchips dealers for Lebanon ). And, last, what are your conditions for shipping to Beirut , Lebanon . 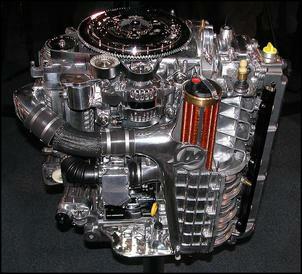 I am really interested in the Nissan VG30DETT engine. I am not real good when it comes to engine stuff - I just want to know the price on this kind of engine. Check out a few Japanese import wrecker websites. For example, www.adelaidejap.com lists VG30DETTs at AUD$4000 (engine only) or AUD$5000 for an engine package (including ECU, airflow meter and wiring). First, your mag is a great reference for people interested in cars and Do-It-Yourself. I have recently - commonsense over passion - purchased an older 4x4 for work instead of a sports car. But I still have the desire to modify the suspension and engine. I purchased a ‘94 Mazda Bravo that, from all the research I have done, uses a G6 engine. I haven't been able to find any info about modification or the origins of this engine but I believe it is a variation of the Mitsubishi Astron block with a Mazda 12-valve head. 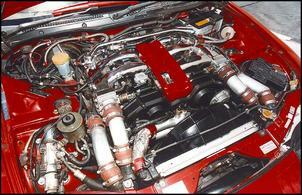 Are you aware of the origins and interchangability of this engine with the Mitsubishi fours? Any power upgrades? I was thinking of a low-pressure turbo and intercooler application for reliability - and maybe using the existing LPG system for low fuel costs. Any suggestions or experience with this engine would be appreciated. We are not aware of any upgrades specific to the G6 engine. But for a one-off turbo installation, we suggest a custom exhaust manifold and a second-hand Nissan turbocharger as the cheapest way to go. The exhaust manifold from the turbocharged Mazda MX-6/626 (F2 engine) might also be a good starting point, given it’s a Mazda-based 12-valve head. Can any readers help further? I’ve got a 1993 Toyota Celica – front-wheel-drive with a 2.2 litre 5S-FE engine. What FWD engine could be swapped for a big increase in power? Your best bet is a 2.0 litre DOHC turbo 3S-GTE (as fitted to the Celica GT4). Of course, you won’t have the GT4’s AWD system but you’ll have a good hit of power. Yes, we’ve seen a few similar concepts recently. These ‘rear-mount’ turbos are interesting - but we’ll reserve our judgement until we’ve driven something similar. 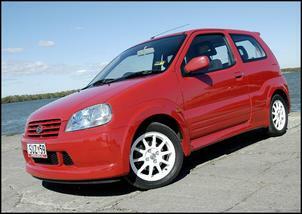 Regarding your October 2004 review of the Suzuki Ignis Sport (Suzuki Ignis Sport Test), the following line is used... "But the suspension - yes even that live rear axle - did very little wrong." Surely you meant "dead” or “beam rear axle" - being front-wheel-drive, the rear axle is not live... Yes, the Suzuki is unusual these days for having a rear axle (non-independent rear suspension), but it sure as heck ain't live!